"Birthday" redirects here. For other uses, see Birthday (disambiguation). 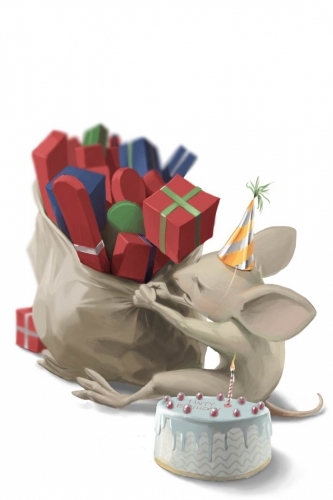 The Birthday Mouse is an Event Mouse found during the annual MouseHunt Birthday event. Information on how to locate and capture the Birthday Mouse can be found on the current MouseHunt Birthday location page. 5 March 2009: The Birthday Mouse was released to commemorate MouseHunt's 1st Birthday on 7 March 2009. The Birthday Mouse was found in all locations except the Meditation Room and Pinnacle Chamber. Due to a glitch, the Birthday Mouse could be caught in the Meditation Room when it was first released. This was fixed shortly afterwards. The Birthday Mouse looks similar to the Elf Mouse, but with a birthday hat and a birthday cake next to it. This page was last edited on 9 April 2017, at 00:02.